May I take this opportunity to welcome you as new parents to Ysgol Croes Atti. I hope that your association with the school through your children will be a happy and rewarding experience. The Handbook you are about to read provides information about Croes Atti, Flint and Shotton, its aims and objectives, its curriculum, its policies and various activities therefore commend it to you in the hope that you will find it a useful introduction to the School. Ysgol Croes Atti is a Welsh Medium Primary School within the Local Education Authority, at present educating almost 250 pupils in the 3 – 11 age range. We feed Ysgol Maes Garmon, the local Welsh medium Secondary School in Mold. Obviously you, as parents of children at school, or those who may be considering sending your children to Croes Atti are welcome to visit us any time, though a prior request for an appointment is always appreciated. Finally, please note that the information contained in this Handbook is correct at the time of publication. However it cannot be assumed that there will be no changes in the arrangements indicated during the course of the year or in subsequent years. 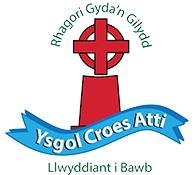 Ysgol Croes Atti, Chester Road, Flint, CH6. 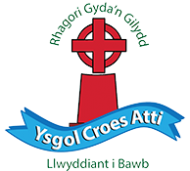 Ysgol Croes Atti, Plymouth Street, Shotton, Deeside, CH5 1JD.